Asian cuisine, of all descriptions, is one of my all-time favorites. So much so that my first foray into Chinese cooking came when I was in high school. I discovered that my mom had a Chinese cookbook that I'd never even seen before. I just happened upon it on the bookshelf. I began reading it and quickly realized that it was a pretty complicated and authentic cookbook. But, despite the pretty intense techniques described on those pages, I was enthralled and undaunted. Thinking back, it was my early high school years when cooking really became interesting to me. A complicated recipe didn't intimidate me because I had no experience, therefore, no fear of failure. Just follow the instructions. I remember tackling fried rice from this book I found. I think I really surprised my family. Next, came my French club's "cafe" at school. Traditionally, the "cafe" was really just a bake sale. Well, as French club prez, this simply would not do for me. 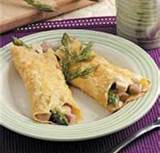 I hit the books, experimented at home, and the day of our sale, we trucked in a microwave to the courtyard at Irmo High School and served up a lunch plate of chicken crepes, green beans amandine and a croissant, in addition to the usual French baked goods. It was a resounding success. So, back to Asia...I credit my friend Susannah for teaching me to make what I simply call dumplings but most of you know as "potstickers." First, do you know why they are called that? You must brown the bottoms well before adding water to steam them. If you don't, they'll stick to that pot like they have super glue on them. Many a cook has lost a pan to a bad case of true pot-stickers. While she was in law school, Susannah had a bunch of us over for a casual get-together. I wandered into the kitchen for a beer to find her finishing up her dumplings and heating up a pan. She had my attention. And, I've been making my own ever since. After Viv's school Halloween carnival, we came home to make dumplings. Btw: she's a "glampire." Ya know, a glamorous vampire. I make them differently depending on what I've got. Suze always used ground pork, which back in the glorious early 90's wasn't easy to find. In fact, I'd usually go to the Fresh Market and buy good looking pork then have them grind it up. Then, I started using ground turkey, which works just as well, but needs a little extra seasoning because, you know, it's turkey. I've added soy sauce, ginger, water chestnuts, cabbage, green onion, bamboo shoots, garlic...whatever I have available. Twist up those little babies and they're cooked and ready to eat in minutes. Tonight, I had the great pleasure to teach Viv how to make them. Gotta hand it to her...I showed her how to do it twice and then left her to it as I tended to our veggie/chicken rice. The kid picked right up on it and made the majority of them all by herself. Then, feeling confident, she invited Neil into the kitchen for her to "teach" him how to make them. As is so often the case with kids, having made them herself, she loved them and devoured them. And, just to see the confidence exuding from her as she took charge of the project was delightful. And, under her tutelage, Neil twisted up some fine dumplings himself! Add your filling, then fold 'em up! Plate 'em up while they're hot! Wanna make some? Buy some wonton wrappers and assemble any combination of ingredients you like. Adding some soy sauce, ginger, garlic, etc. to the meat mixture is important, I think. Tonight we used ground pork, fresh ginger, minced water chestnuts & green onion. Scoop about a 1.5 tsp of filling in the middle of the wrapper. Dip your finger in water and wet all four edges of the wonton. Fold two corners up to meet, then bring the other corners in and pinch it all together to make a little "purse" shape. Heat a pan with a thin layer of oil in it. When hot (medium-high heat) place the dumplings in the pan. Cook until the bottoms brown and the dumplings release on their own. (Shake the pan and see if they will move around on their own.) When this happens, add a quarter cup of so of water and cover to let them steam. **Tip** Hold the lid in front of you, angled over the pan as you add water so you don't get spattered** Steam them until the wonton wrapper becomes translucent. I always take one out and cut into it to make sure the meat is cooked through. Serve with a simple dipping sauce of soy sauce, rice wine vinegar and some fresh ginger & sliced green onion. These are so simple yet so flippin' good! And quick, once you get them all assembled. And, they also freeze well. Try it out and let me know what you think! I love this time of year. The main reason is the weather. You see, living here in SC, we operate at 80+ degrees the majority of our year. Or at least it feels that way. Maybe after 6 months of sweating profusely, watching our plants wither and die, suffering mild heat strokes from time to time and being kind of irritable because we're hot and slightly delirious causes us to jump for joy and breathe a sigh of relief when October finally arrives. I got married in October, there's Halloween, mums and decorative kales show up in our yards and gardens and the festivals kick into high gear. 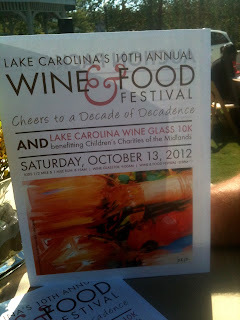 We were invited to attend the Lake Carolina Wine & Food Festival on Saturday, October 13th. This was the 10th year of this festival, and I'm embarrassed to say that I had not attended it before. The festival is held in the lovely Lake Carolina neighborhood and proceeds benefit Children's Charities of the Midlands. The festival was held from 2-5 p.m. We got there right at 2:00 so we could have plenty of time to try everything and take our time. As we checked in, we received a commemorative wine glass and a one of those cool plates that has the notch cut in it to hold your wine glass while you eat. We walked onto the "town square" and surveyed the scene. The first thing we noticed was there was tent set up with athletic team flags attached and underneath there was a big screen TV playing the games and big, comfy leather couches for the sports enthusiasts to enjoy. I've never seen that done and thought it was a cool detail. Next, we noticed that the tasting stations were basically alternating from food to wine to food to wine, etc. At the end of the square was a live band called Two for the Road. 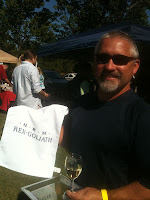 We started with a glass of Rex Goliath. I chose to drink red this day while Neil was going to handle the whites. My first glass was a "free range red" which is a blend. Very nice wine. I tasted it and came back later for more of it. Neil chose the chardonnay and also returned later for more of it. 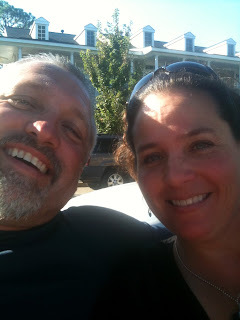 We started our nibbles with a restaurant in NE Columbia called Polliwogs. 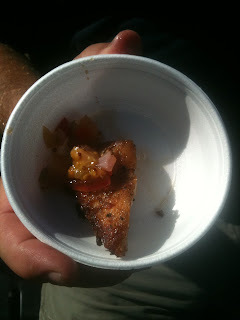 We sampled pulled pork spring rolls, a pimento cheese/fried green tomato/bacon sandwich and chicken gumbo. Yum all around, but I must say, the BLT was the bomb-diggity. Next, we wandered over to Cafe Caturra and had a bite of guacamole and hummus. My next wine was a Malbec called The Seeker. Another good wine that I'd never tried before. Neil again went with Chardonnay leading to a thumbs-up. 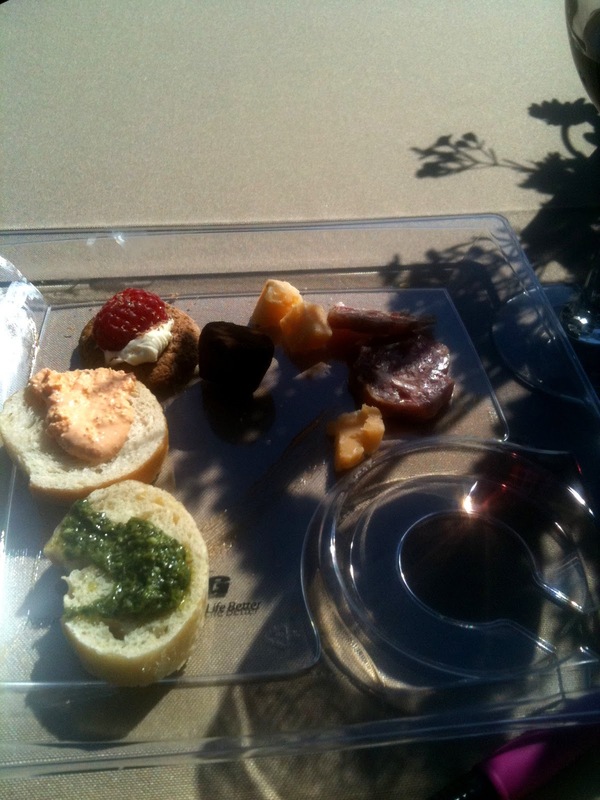 Earthfare had a beautiful and classic hors d'oeuvres display. Along with pouring wines, they offered a salami, cliantro-lime pesto crostini, Zola (a hard cheese that I learned is a 24 month aged gouda), buffalo (like wings) crostini and a gingersnap topped with mascarpone and a scarlet raspberry. The Zola was an interesting cheese; dry and crumbly like a parm, but sharper. Even though I'm not a big sweet eater, I loved the gingersnap. In fact, I think next time I have friends over for dinner I'm going to serve that with coffee. 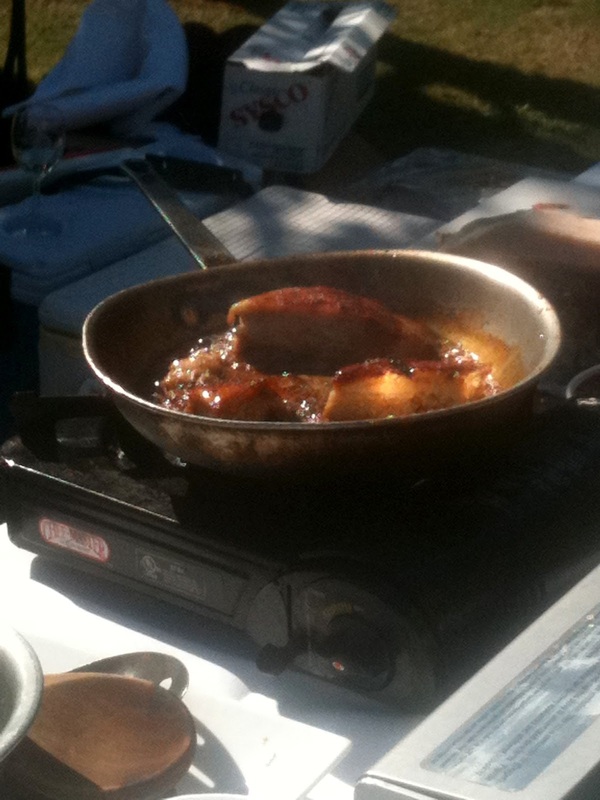 Another really interesting element of the festival was a cooking demo by Chef Bertrand Gilli. He made crepes Suzette and then served them to us hot out of the pan as soon as the flames subsided. La nourriture des dieux! Those French really know what they're doing. Next, we visited Sweet T Gourmet. Again, I'm not a huge sweet freak, but I know good desserts when I taste them! Holy bakery! These ladies have got it goin' on. We tried the pumpkin gooey butter cake (my fave), dark chocolate tartlet with ganache, shortbread pecan tartlet, and the decadent fudge cake. I loved the rich and prominent flavor of good quality butter in the gooey cake. The decadent fudge was also great...chocolatey, soft, gooey and well, decadent. Let me comment at this juncture about the band, Two for the Road. What a great musical choice these guys were! When we arrived, the first thing that caught our ear as we stepped out of our car was a "bluegrassy" version of Pink Floyd's "Comfortably Numb." Yeah, you heard me right. Who would have ever thought to take a cult classic song, by my all-time favorite band btw, and add a twang-i-ness to it? Brilliant! We also appreciated their version of Tom Petty's "Last Dance with Mary Jane." Mr. Friendly's/Solstice/Cellar on Greene was probably the culinary star of the day. Chef/owner Ricky Mollohan was there on site cooking up a storm and had the folks lined up! I think his smoked gouda & bacon mac 'n cheese stole the show. It was fantastic. One bite sent you into that creamy, rich, decadent mac 'n cheese place where people go, while at the same time you felt a little naughty and guilty by eating and enjoying it so much! 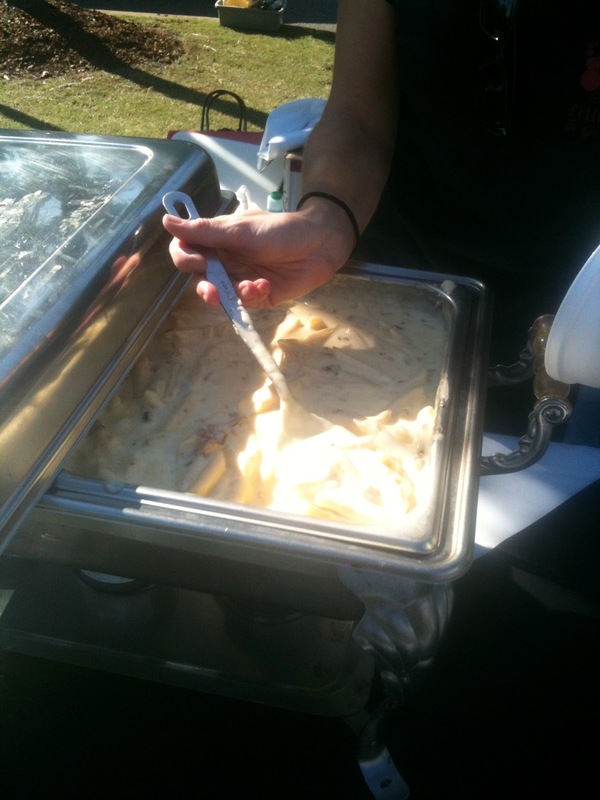 And, like I said, our fellow festival goers were lined up for this little dish of golden pasta. 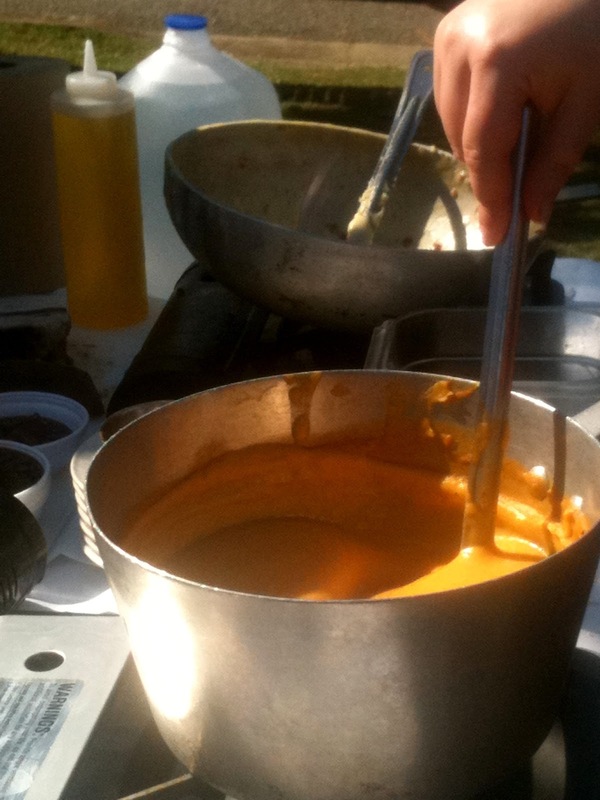 They also offered a pumpkin bisque that was simply delicious. Once the festival got going, Ricky broke out some gorgeous pieces of pork belly and seared away. Once the word spread about pork belly, the folks were lining up again! 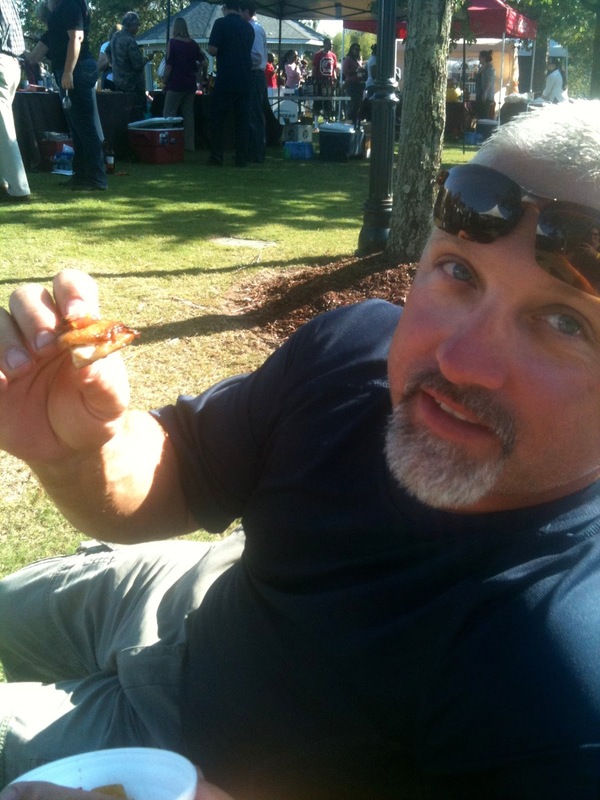 Neil's getting impatient with the picture taking: I wanna eat this pork belly! I mean, really...look at that smile! The Fresh Market had a booth serving Ravens Wood and Hogue wines. I sampled the Cabernet Sauvignon and the Zinfandel. Both were really nice wines, but the Zin was my favorite. Neil tried the Hogue and Ravens Wood Chardonnay. He liked both but felt like the Ravens Wood was a bit lighter, which for a day out in the gorgeous sunshine was what hit the spot for him. Turns out, my new friend, Sandra was the lovely lady pouring at this booth (and the rockstar who invited us to the festival). As Neil and I sat down on a park bench to sip and munch, we noticed that she was working like crazy with lines of her own, and she was all alone. Neil set off to make a plate of food for her and I joined her in the tent to pour wine. 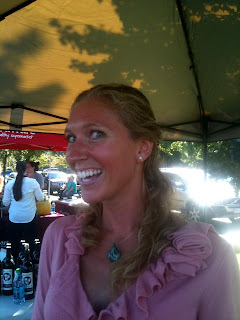 We had so much fun talking to all the wine tasters and with each other. In fact, I realize now that I'd love to volunteer for that job sometime. I loved it! In short, we thoroughly enjoyed the Lake Carolina Wine and Food Festival and will definitely return next year. If you are unfamiliar with Lake Carolina, check out their website. It's a master planned community with a family lifestyle built into their vision. Most of you know that I am a Realtor and I have had the pleasure of helping numerous clients buy homes in Lake Carolina. It's a beautiful place and worth checking out if you're in the market for a new home in Northeast Columbia. Thank you Lake Carolina and Wild Honey for putting on a fantastic event. And, thank you Sandra for inviting us to attend!